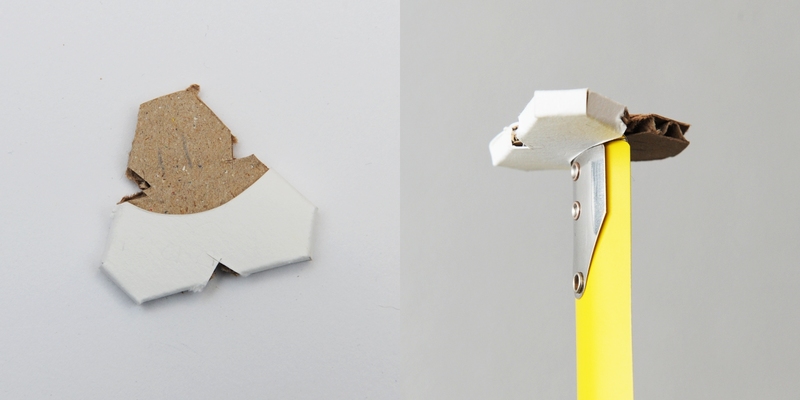 For our second project in the Make It Last Build Series, we’re constructing a robotic plant. This week, we’ll build a papercraft flower to sit on top of the metal stalk that we built last week. Combined with the plant brain and metal stalk, that we have constructed in the previous weeks, we’ve got all the pieces for a functional robotic plant! Grab the parts template, print it full size (8.5″ x 11″), then use it to cut your parts out of cardstock. For the flower bloom, you can use colored paper, or paint your own. We painted ours using acrylic paints, and colored the insides and outsides differently. Once you have them cut out, the flower petals are pretty easy to assemble. All you need to do is bend the petal in so that the two holes at the bottom overlap, then dab some glue in between them to secure them in place. Here, they are shown with the cut-out flower base. Next, we need to bend some wires to make the hinge mounts for the flower petals. First, use the flush cutters to cut three pieces of 22 AWG wire about 2 3/4″ long. Then, use the needlenose pliers to bend them into a U-shape, with each end of the u about 1″ long, and a 3/4″ section in the middle. Finally, add a perpendicular kink in the wire, perpendicular to the U-shape, which will hold the mount upright. See the next instruction for a photo of what the kink should look like. 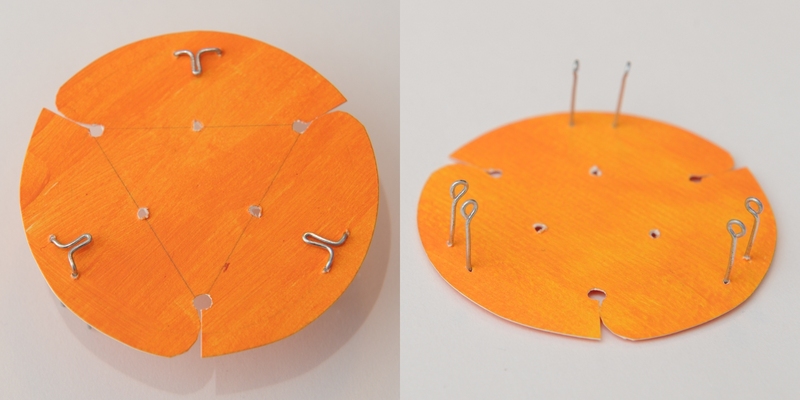 Once the wires are cut out, mount them in the flower base by sticking them through the provided holes. Use the needle nose pliers to make a loop at the end of each wire, which will act as the hinge to allow the petals to open. Make creases on each of the plant base edges, then glue together the flaps to finish the flower base. 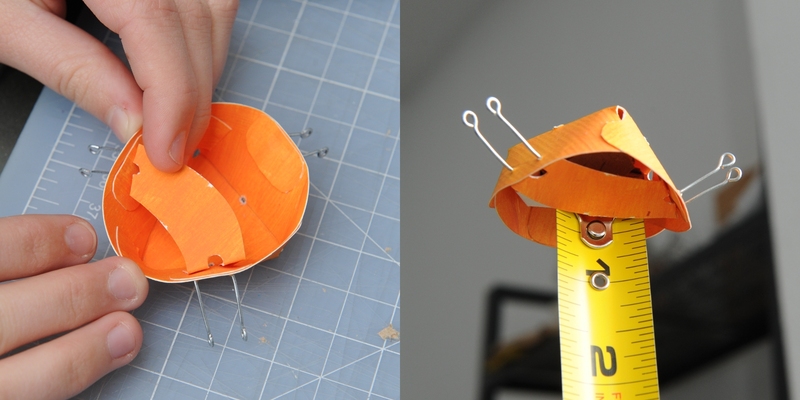 Now, make an adapter to allow the plant base to attach to the tape measure head. Cut out a triangle of cardboard just big enough to fit inside the plant base, and cut the tips of the corners off of it. Wrap one side of it in cardstock, forming a pocket on the other side. 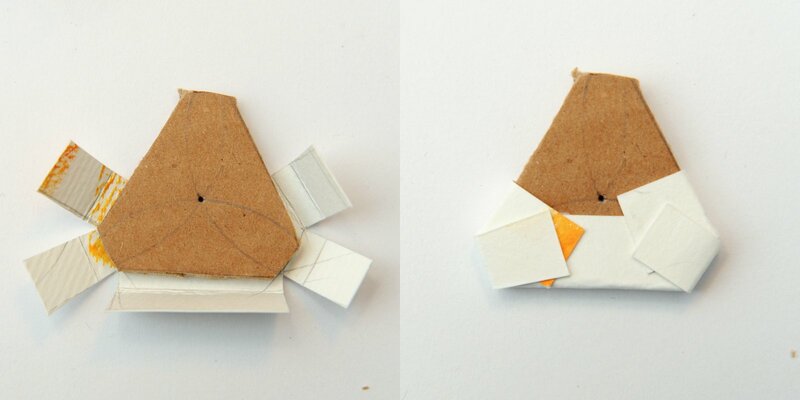 Glue the non-pocket side of the cardstock to the cardboard to attach it securely. Cut a groove in the cardstock pocket so that the tape measure head fits inside it, with the triangle roughly centered on the tape measure head. Finally, cut a notch in the middle of each triangle side, to make room for the fishing line that will be used to open the flower petals. Flip the flower base over, then attach the base mount to the bottom. This will be what holds the flower to the plant stalk, so it should be mounted so that the cardboard triangle on the tape measure head fits snugly inside of it. Step 9: Connect the petals, and wire the flower! Attach each of the petals by running a 1.5″ long piece of metal wire through one side of the petal, through both hinges on the plant base, then out the other side of the petal. Lock the wire in place by bending a loop at each end. If all went well, the petal should easily flip open and closed. Finally, attach a length of fishing line or thread to each petal. This line is what will cause the plant to bloom, by pulling each petal open as the plant rises and the line becomes taut. Tie the line to the bottom of the plant bloom, then run it up the inside of the flower base and through the nearest hole in the top, over the top of the flower base, then down and out the other side. When you pull on the line, the petal should open outwards, and then remain open until it is closed by hand. We’ll cover how to align the flower and cause the plant to bloom next week, but for now you can set the flower on its stalk to get a feel for how it will look! You can also pull on the fishing lines to get a feel for how the blooming mechanism works.